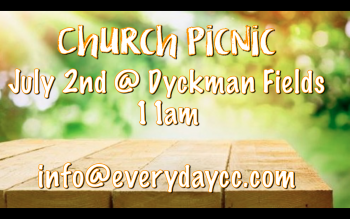 This coming Sunday, July 2 , there will be no teaching service at Everyday Church, because instead we’re getting together as a family to celebrate the Summer with a BBQ in Dyckman Fields park! We hope you can join us. As we continue with our Tell Your Story series, this Sunday is the perfect opportunity to start conversations, make new and deeper friendships and enjoy being together with your faith family.